Where can the danger be lurking? Two soldiers are huddled together, one gazing up at the sky, the other darting a sideward glance. They derive a tacit reassurance from their weapons, but they are both in their different ways alone and scared. They were painted by Ambrogio Lorenzetti in the Palazzo Pubblico in Siena, and they seem symptomatic of a state of emergency: the year was 1338, and the spectre of the signoria, of rule by one man, was abroad in the city, undermining the very idea of the common good. 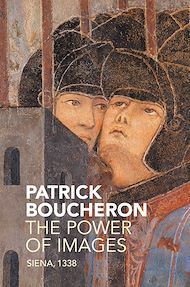 In this book, distinguished historian Patrick Boucheron uncovers the rich social and political dimensions of the iconic ‘Fresco of Good Government’. He guides the reader through Lorenzetti’s divided city, where peaceful prosperity and leisure sit alongside the ever-present threats of violence, war and despotism. Lorenzetti’s painting reminds us crucially that good government is not founded on the wisdom of principled or virtuous rulers. Rather, good government lies in the visible and tangible effects it has on the lives of its citizens. By subjecting it to scrutiny, we may, at least for a while, be able to hold at bay the dark seductions of tyranny. From fourteenth-century Siena to the present, The Power of Images shows the latent dangers to democracy when our perceptions of the common good are distorted and undermined. It will appeal to students and scholars in art history, politics and the humanities, as well as to anyone interested in the nature of power.